Google finally decided to open its Google Glass Explorer Edition up to non-developer consumers this week, although the product is still in Beta mode and costs an astounding $1500. The one advantage of Google Glass is that Google offers prescription lenses as well as shades for those who want to use Google Glass in the gorgeous summertime weather. Google Glass, despite its cool factor, serves a very significant purpose: its early uses have been mostly in the fields of medicine and health, to aid doctors who need their patients’ medical and health information immediately when in the patient’s hospital room. A new report shows that the University of California-Irvine’s medical school is setting a new trend: incorporating Google Glass into its four-year medical school program. UC-Irvine is the first school in the world to incorporate Google Glass, but every student will not receive a Google Glass unit. UC-Irvine expects to allow first and second-year students to use Google Glass, but the medical school program will distribute Google Glass units to third and fourth-year students who are advanced in their programs and near the end of their medical school career. UC-Irvine Assistant Clinical Professor of Emergency Medicine and Associate Dean of Instructional Technologies Dr. Warren Weichmann says that Glass will continue to serve the goal of medical education: “medical education has always been very visual and very demonstrative, and Glass has enormous potential to positively impact the way we can educate physicians in real time. Indeed, all of medicine is based on ‘seeing,’ not ‘reading,’ the patient,” Weichmann told CNET. Google Glass has been busy making its way around the United States. Google has taken Glass on the road to cities such as Durham, NC, and the NYPD and United States Air Force are currently testing Google Glass. 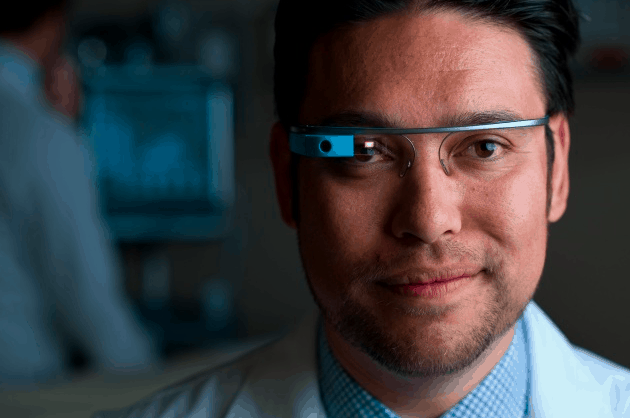 Boston’s Beth Israel Deaconess Medical Center is testing Glass with its doctors in emergency-room situations, and the Indiana University Health Methodist Hospital in Indianapolis is the first hospital in world history to use Google Glass in surgery. IU Health performed the surgery a few months ago, removing a tumor from the mid-section of a 45-year-old runner and father, Brian Hume, while repairing his abdominal wall simultaneously. Deidre Richardson is a graduate of the University of North Carolina at Chapel Hill who has discovered her passion for tech a little later in life than expected. What started as a venture into crime-fighting technology has turned into a love for mobile gadgets (smartphones, tablets) that doesn't look to slow down anytime soon. Having just picked up the Galaxy S5 recently, she's always doing what it takes to stay on the cutting edge of technology. Become GeekSays exclusive subscriber and get all the spice directly in your mail. GeekSays is a technology news and geeky gadgets blog / community, dedicated to the latest technology news and gadgets from all over the tech industry. GeekSays focuses on the upcoming latest technology scoops about iPhone, Apple, Samsung, Google, Android, Microsoft, Windows, BlackBerry, and the latest geeky tech gadgets. GeekSays plays an important role in breaking technology updates about upcoming events, tech devices, features, gadgets and verdicts from all the mainstream technology companies. It also covers tutorials on how to use the iphone, reviews of best android apps, iOS downloads,..